Japan established the puppet-state of Manchukuo in 1932, as a colonial outpost for its imperialist expansion into China. Hundreds of thousands of Japanese settled in the colony in the years that followed, occupying farmland seized from the region's Chinese inhabitants. Settler identities and motivations, like those of other colonial regions, varied immensely: some saw themselves carrying out an idealistic mission to counter western colonialism with an Asian hybrid version; others were left-leaning Japanese driven from their homeland by the increasingly right-leaning government and lured by the promise of greater freedom to enact social reform; many were simply poor families driven by desperation, not to mention the usual suspects drawn by the lure of greed, profit and violence. Some were drafted and forcibly relocated to China. Whatever their motives or circumstances, backed by the firepower of the brutal and repressive Japanese imperial army, they acted like colonists anywhere, dispossessing local peoples and occupying the top niche in a complex, racialized hierarchy. This was the environment in which renowned Japanese poet Takarabe Toriko grew up. Her parents moved to Manchukuo when she was an infant, and she spent the first 11 years of her life there. The story is depicted, in loosely dramatized form, in her autobiographical novel Heaven and Hell (published in 2005 in Japan, and now translated into English by Phyllis Birnbaum). Heaven refers to the years of Japanese ascendancy in Manchukuo, when she lived comfortably as the privileged daughter of a colonialist, imperialist occupying force. Hell refers to the period at the end of the war, when the tables turned and her family was forced to flee in the face of Soviet invasion and Japanese surrender. She lost a brother and her father during the protracted, torturous evacuation to a homeland she had never known. Toriko, or Masuko as she is referred to in the book, reveals the powerful and tragic forces of colonialism, and the ways in which the politics of race and citizenship exacerbate their manifold tyrannies. "Now the Chinese people rank first, and the Japanese people rank fourth!" taunts a Chinese boy as her brother tries bartering with him for a sweet-cake, following the Japanese surrender. The child's-eye view of colonialism and ethnic conflict is all the more powerful for its combination of the everyday with the horror of a protracted, genocidal war. Toriko's portrayal of colonialism is especially impactful for being situated in a context which readers in the West may be less familiar with. The action is set in northern Manchuria, yet the atmosphere evokes that of the American 'Wild West', another colonial frontier characterized by the violent expansionism of a privileged, well-armed settler class driven by racism and a sense of divine destiny. Her violent, abusive father is at his element in this environment, and he prefers spending his time in the most remote settlements, building log cabins for new settlers and teaching them how to survive by hunting and fur-trapping. As the frontier town of Jiamusi, where the family settles, expands and becomes more 'civilized', he spends less time there, to the relief of his terrified children. Movie cinemas, dessert cafes and police patrols replace the rough-and-tumble violence of a 'frontier town' whose streets were lined with the heads of bandits stuck on pikes when they first arrived, and her father finds himself at odds with the imposition of order. Toriko's novel is a powerful evocation of a period in which Japanese colonists, Russian hunters and merchants, Communist Chinese agents, Indigenous local populations and Chinese urban elites co-existed in an awkward, frontier-style peace with each other (loosely enforced by the brutal and well-armed Japanese imperial army). It's punctuated by rounds of violence (her father discovers his wife is having an affair with a Russian merchant and machine-guns the Russian's shop), as well as by the multiple, violently enforced hierarchies which develop under Japanese occupation. When the Soviets defeat the Japanese army and occupy the region the hierarchies are reversed, and the Japanese find their lives devalued and precaritized, much as they had treated others. "The divine winds didn't blow?" asks her nine-year-old brother in bittersweet innocence, upon being told that Japan has lost the war. The varying levels of culpability and complicity in Japan's colonial expansion are probed as well. Some Japanese – especially the long-suffering women of the story – were brought to the settlements against their will when their husbands moved there to seek their fortune (or were drafted and forcibly relocated to the settlements). Others, like Toriko's family, were poor and lower-class Japanese families seeking to escape a life of poverty and misery in their homeland (much like western colonial settlements, there were marked class divides between groups of settlers, and class struggle helped to propel waves of settlement). For a short book, Heaven and Hell packs a powerful punch. Toriko succeeds remarkably in reconstructing her child's-eye perspective of life in the colonial settlements and then the war. Forced to grow up quickly and survive by her wits in a suddenly brutal world, her character struggles to understand what's happening around her. Adults never seem to make sense, and she grows frustrated with their strange, unpredictable and often violent ways. The second half of the book in particular is marked by a profound contrast between innocent child adventures and tragic spaces of violence. The war and occupation becomes hell indeed, characterized by sexual violence (some graphic episodes occur toward the end of the book), disease (no sooner does Masuko make new friends than they sicken and die under the brutal post-war conditions), and a sort of grim nonchalance to the death which surrounds them; it's a world where it has become normalized for children to find and strip corpses of valuables in order to buy candies and cakes on the black market. Masuko befriends a young medical student toward the end of the book; his best parting advice to her is simply "Try not to die." The book also contains a second story in its pages, that of Toriko's mother. She survived the war, and the autobiographical novel is book-ended with her experience: first as a young woman coming to join her husband in Manchuria, lost and homesick, bewildered and frightened in her new home; and then as an elderly woman who lived in Japan into her 90s, whose death catalyzes her surviving children's reminiscences. She suffered immensely during the war, and was divorced by her violent husband after her affair with the Russian. The family is forced back together as they flee the Soviet army at the end of the war; when Masuko's father finally dies of dysentery her mother's response is simply "Well now I won't have to be terrified anymore." Toriko was fortunate to make it back to Japan with at least some members of her family. It is estimated that over 30,000 Japanese children were left abandoned or orphaned in China after the war (a renewed effort was made to locate and repatriate them in the '70s and '80s by the Japanese government). 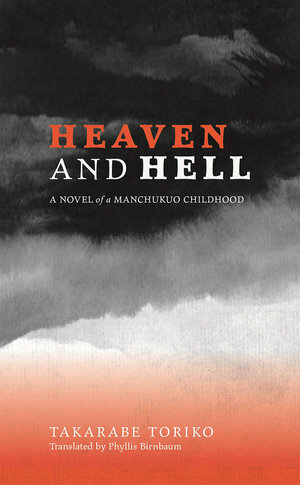 Heaven and Hell is an important read: a superb autobiographical novel depicting a still controversial period of Asian history, and a poignant portrayal of colonialism and the myriad tyrannies of which its legacy is comprised, all contained within an intelligent, compelling, perfectly crafted child's-eye narrative.